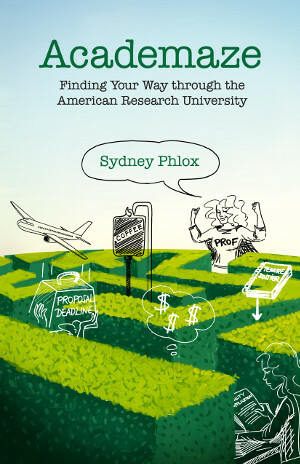 Academaze, a collection of essays and cartoons about academic life by Sydney Phlox, will be released June 20, and is now available for pre-order! A paperback edition will also be available for $14.99. The essays cover a wide range of topics about academic life at a research university, including the academic job search, teaching, mentoring graduate students, surviving the tenure track, scientific writing, grantsmanship, work-life balance, and the additional challenges faced by women in STEM fields. If you’re on the tenure track, hoping to get on the tenure track, or just curious about what, exactly, professors do when they’re not teaching classes, this book is for you.